3 3/4" x 5 1/4". Luxe leather highlighted with a creamy contrast stitch. Pen loop (mini pen is included). 40 sheets ruled memo pad included. Top pocket holds extra business cards. Please call us at 800 310-2723 for customization options on this product. 5 1/8" x 3 7/8" x 1/2". Left side has 3 card pockets. Great for business cards, credit cards, and driver's licenses. Back of wallet notepad holder has large pocket holder. 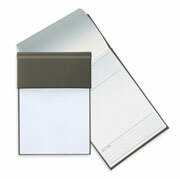 3" x 4" 40-sheet blank note pad included. Gunmetal mini-pen included. 10 Characters Per Line, 3 line maximum. Personalization charges of $10.95 will apply. Have your company logos, trademarks, special fonts, etc. added to this piece. Standard die charges of $65.00 will apply. Run Fee charges of $0.75 per item will apply. The $65 die charge, for a die up to nine square inches, will be added to your shipping fee. 4 1/2" x 3" x 1/2" (closed). Contains three 3 1/2" x 2 1/4" 40 sheet mini size pads, To-Do Lists included. Gunmetal mini pen included. Outside and interior pockets store receipts, business cards, etc. 5 Characters Per Line, 3 line maximum. Personalization charges of $10.95 will apply. Have your company logos, trademarks, special fonts, etc added to this piece. 5.25" (h) x 0.25" (w) x 3.5" (l). Inside has pockets for business cards. Elastic pen loop (no pen included). 3" x 4.75" unlined writing pad included. 640 white pages with gray printing, perforated to leave a 1 7/8" memo stub at the top of the pad. Size: 5 5/16" x 7 7/16". The cover is made of quality high-grade polyurethane, a smooth surface with a matte finish. Available in Gray (shown), Light Blue, Periwinkle, Purple and Red. 8 1/8" x 5 3/4" x 7/8". Premium full-grain leather with fabric lining. Elastic pen loop (no pen included). Inside slots and pockets for notes and business cards. 5" x 8" ivory pad is included. 25 Characters Per Line, 3 line maximum. Personalization charges of $10.95 will apply. with larger dies costing an extra $3.50 for each additional square inch. 640 white pages with gray printing, perforated to leave a 1 7/8" memo stub at the top of the pad. Size: 5 5/16" x 7 7/16". The cover is made of a smooth, soft-textured material that is often mistaken for leather. Available in Burgundy, Terracotta, Black, Green, Navy, Periwinkle, Royal Blue, Red, Light Green (shown), and Burnt Orange. 4" x 2 7/8" (closed). Made of Black Gloveskin vinyl. Has hand stitched and turned edges. Internal storage pocket. External pocket for cards. 10 "Things To Do" cards included. 2 1/2" x 4 1/4" (closed). Perfect for people on the go or at conventions where jotting quick notes is a necessity. Pocket on inside flap for cards. 40 sheet refillable note pad included. Colors: Black, Blue, Red, White and Green. Other colors available upon request. 3 Initials or 5 Characters Per Line, 3 line maximum. Please indicate the foil stamp color you would like on your memo pads. Personalization charges of $10.95 will apply. Standard die charges of $65.00 will apply. Run Fee charges of $0.25 per item will apply. The $65 die charge, will be added to your shipping fee. 5" (h) x 0.5" (w) x 3.5" (l). Has pockets for business cards. Pen loop (no pen included). Includes a 3" x 4.75" writing pad. 5.25" (h) x 0.5" (w) x 3.5" (l). Has a pocket for business cards. Elastic pen loop (no pen included). Includes a 3" x 4.75" writing pad. 3" x 4 1/4". Vinyl refillable memo jotter has white stitching on covers. 2 1/2" x 3 7/8" white lined notepad with 60 sheets included. 5.625" (h) x 0.875" (w) x 3.5" (l). Includes solar calculator. Elastic pen loop (no pen included). Front cover business card pocket. 3" x 4" unlined writing pad. 5.25" (h) x 1/2" (w) x 3 1/2" (l). Front cover USB memory flash drive holder. Elastic pen loop on front cover (no pen included). Inside has 2 business card pockets. 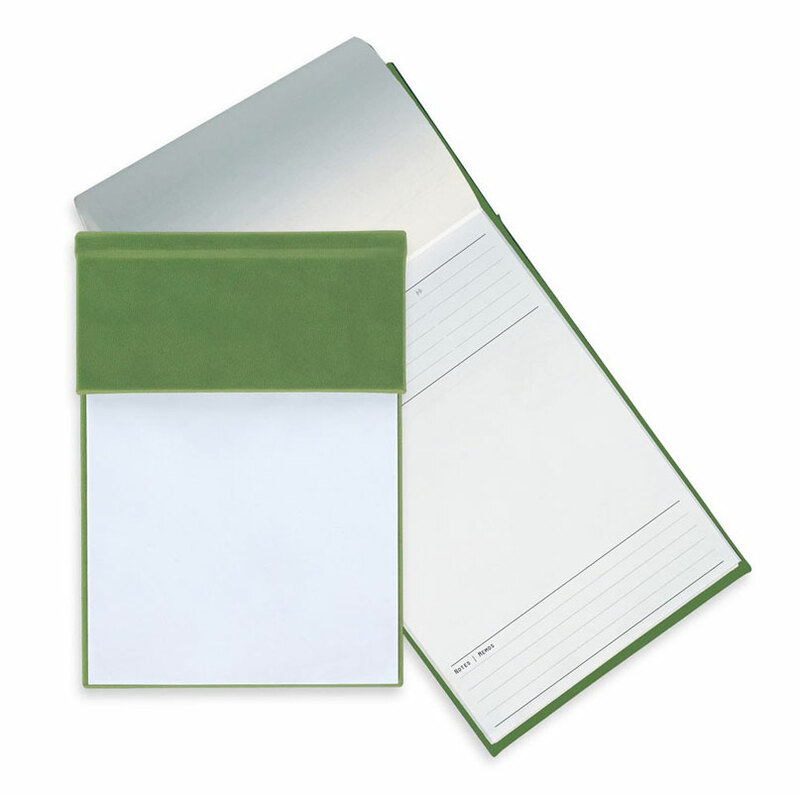 Includes 3" x 4.75" Scripto writing pad. 5" (h) x 0.25" (w) x 3.75" (l). Business card pocket located on the inside left side of the jotter. Double pen loop locking closure (no pen included). 3" x 4.5" unlined Hampton writing pad included. 5" (h) x 0.5" (w) x 3" (l). Small ultrahyde covers with a built-in elastic closure. Includes 80 sheets of ruled perforated paper pad.